Although it’s cheap when compared to other aquarium supplies, a fish tank heater is just as important; if not more. All fish require temperatures similar to those of their natural habitat to thrive. 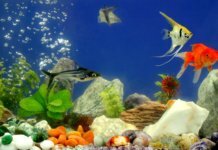 However, choosing the right aquarium heater isn’t always easy, and a poorly constructed one can do more damage than good. To help you with your decision, we reveal our top 5 best fish tank heaters that deliver the best quality and performance. The best performers in our review are the Fluval E, Eheim JAGER, and the Fluval Marina “Mini”. 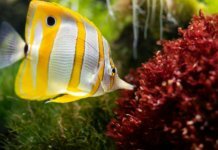 Here’s more information on choosing the right aquarium heater for you, along with a detailed review for each product we chose. Aquarium heaters usually come in two types – submersible and hanging. 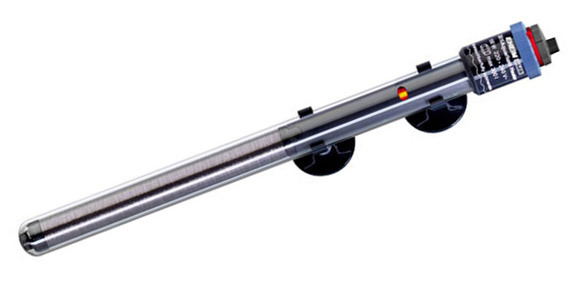 Submersible fish tank heaters usually need to be fully underwater, allowing you to place or conceal them more easily. Because of the water-tight design, they’re usually more expensive than other heater types. “Hanging” heaters are only partially submerged, the heating part being inside the aquarium, while the temperature dial stays above water. Aquarium heaters come in various power capacities, the recommended volume to wattage ratio being 1:(3-5). That means that for every gallon of water, 3-5 watts of power are required to keep the temperature at an optimal level. Power ratings are not measures to be careless with. A few extra watts of power over time may turn out to be the difference between a healthy or stressed fish. Regardless of which heater you buy, you should always have a way to measure the temperature in your aquarium. 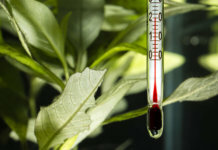 A stand-alone aquarium thermometer is very cheap – but can prevent a disaster. We liked: 5 year warranty. LCD screen provides a live feed of current temperature. 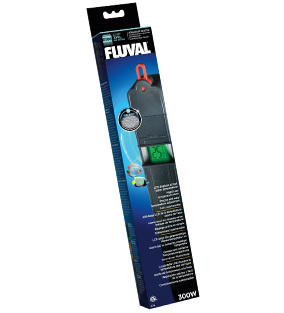 The Fluval E fish tank heater ensures that you have live data from your aquarium, always keeping you on top of things. The temperature in your aquarium is constantly monitored and displayed on a small LCD screen – in real-time. If the temperature goes outside the preset values by +/- 2°F, the screen will change in color, alerting you of any risks. If any external factors (like an aquarium chiller) cause a >5.5°F change in temperature, the screen will flash to draw your attention. Keeping with the precision theme, this aquarium heater allows you to set desired temperatures in increments of just 0.5°F. It comes in several sizes, ranging from 100-300W, ensuring a good fit for most fish tank sizes. Finally (as if all the precautionary features weren’t enough) this heater comes with a whopping 5-year warranty. We liked: Automatic safety control protects the heater from running dry. Fully submersible. Opting for efficiency over a list of accessories and features, the EHEIM Jager has remained a very popular fish tank heater – and rightfully so. Similarly to the Fluval E, this heater knows when to turn itself off – it will shut down if the water level dips too low due to leakage or evaporation. Additionally, you can fine-tune the temperature in increments of 0.5°F. 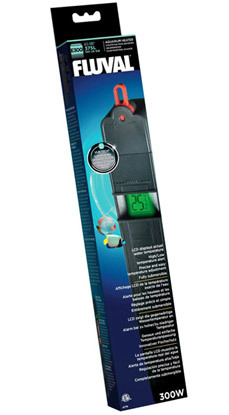 This fish tank heater is 100% submersible and water-tight, ensuring easy placement. The indicator light allows you to monitor the temperature with just a quick glance, while the sturdy, shock-resistant glass shell protects the heater from shattering. The Jager heater comes in various sizes, with power outputs ranging from 25-300W, ensuring a good fit for most aquariums. 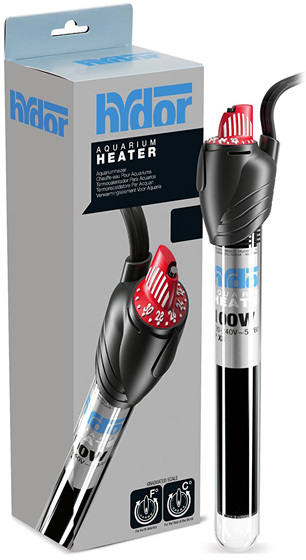 We liked: Its small size makes this heater excellent for Betta fish tanks and small aquariums. If you own a Betta fish tank, or a nano cube, you probably know the struggles of finding a heater that fits. 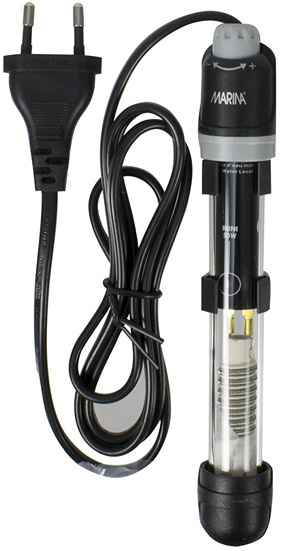 Fluval’s “Mini” Heater has a height of just 6 inches, ensuring easy placement in most small fish tanks. The water-proof design only makes placement easier, as you can place it horizontally, as well as vertically. The temperature dial is visible and easy to access, while the impact-resistant glass ensures better durability. 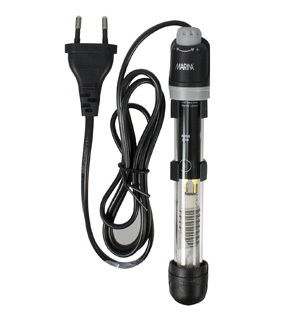 This small aquarium heater comes in two sizes – 25W and 50W. While very powerful for its size, this is only enough power if you own a small tank. We recommend the Fluval E (or any other heater from our list) if you own a tank of 10 gallons and above. We liked: Sturdy, fully submersible. Built-in thermometer. We found the ViaAqua Quartz to be fairly inexpensive and reliable. Like the Eheim Jager, it has an on/off indicator allows you to monitor when the heater is operating. Its built-in aquarium thermometer is visible and easy to read. The temperature is displayed in both Celsius and Fahrenheit, which is a nice touch. This aquarium heater is fully submersible, and needs to be underwater in order to work. The sturdy quartz construction is fairly impressive and sturdy. 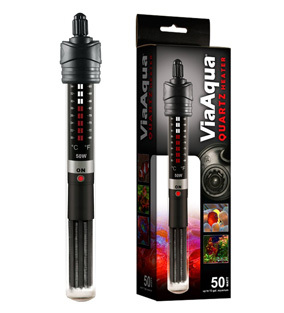 Like most aquarium filters from this review, the ViaAqua Quartz can be found in several sizes, ranging up to 300W. We liked: No damage if run dry. Shatter-proof. If you’re looking for safety and durability, but are on a budget, the Hydor Theo is a solid choice. It doesn’t have as many features as Fluval E, but we found it to be extremely sturdy and durable. Running most aquarium heaters outside of the tank would immediately destroy them. The Hydor Theo, however, won’t break even if it’s run dry. The temperature can be set accurately thanks to the easy to read scale. This heater can be placed vertically or horizontally, thanks to its submersible design. 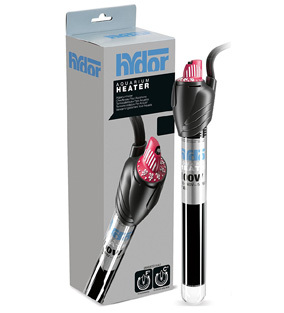 This heater also comes up in several sizes, going up to 200W. While this is plenty for most aquariums, we wouldn’t recommend it for fish tanks of 75 gallons and above.